Thickness (TH) is the distance between two pressure levels in the troposphere. The most common thickness parameter given with the Skew-T is the 1000 to 500 mb thickness. Other thickness parameters are also important to study, especially in winter weather situations. Thickness depends on the average temperature and moisture content in a column of air. As temperature and/or moisture increases, the thickness increases. This occurs since warm air has more energy (more collisions of air molecules with each other) and thus expands to a larger volume. An increase in moisture (more molecules but more lighter vapor vapor molecules displacing heavier air molecules) causes the air to expand to a larger volume. 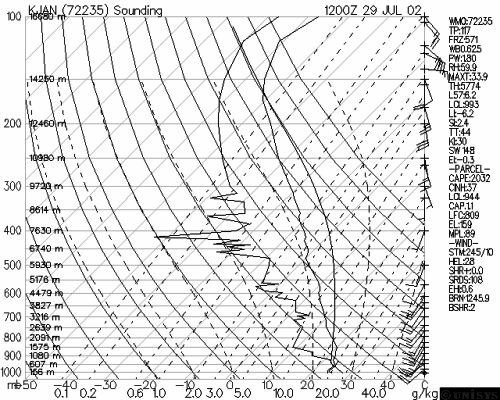 The sounding below gives a 1000 to 500 mb thickness sounding parameter of 5,774 meters. 2. How is TH determined? First, two pressure levels of interest are noted and the height of each of those pressure levels above zero geopotential (basically sea level) is found. Next, the difference in distance between those two pressure levels determines the thickness. a. When using thickness to forecast winter precipitation type, always look at the actual sounding to further support or unsupport the forecasted precipitation type stated as being most likely climatologically. Look at the soundings EWL, temperature lapse rates and surface temperature. b. Mesoscale regions of high dynamic UVV will cool the troposphere more than the models indicate for the synoptic scale. Rain can change to snow in these situations (such as near upper level low). c. Keep in mind how radiation and thermal advection will change the thickness. Examine forecast soundings to get an idea of what change will occur in the future.